Information Is Beautiful | Ideas, issues, knowledge, data – visualized! It’s been almost a week since I flew home from NCTE and I’m still recovering. NCTE is the best conference I attend all year and it’s a must-not-miss for me. I am reinvigorated, excited, and passionate after meeting with my fellow English teachers and learning from them. This year was the best year of all, because I connected with so many of my Twitter pals and they enriched my conference experience. Chris and I arrived on Friday afternoon, ready for dinner. Unfortunately, due to the 3 hours time difference, it was only lunch time. (Sidenote- by the time I got used to the time difference, it was time to go home. Can’t wait for NCTE Boston because it’s on the East coast!). Chris and I checked in to the MGM Signature and it was best hotel decision we could have made. The Signature is connected to the MGM Grand, the convention hotel, via moving walkway and it’s about a 5 minute walk. But the Signature has not casino, is quiet, and has it’s own Starbucks that didn’t have a line all weekend. So awesome! After grabbing a quick lunch, I left Chris to rest and explore while I hit up the exhibit hall and planned the rest of my day. The Southwest flight we arrived on had wifi, so I had made dinner plans with the amazing Chris Lehman and a few other tweeps. I wanted to get the lay of the land first, so I spent some time wandering the exhibit hall (and picking up books, of course). Then, I headed to the Mexican restaurant in the hotel and shared a fabulous meal with Chris, Meeno Rami, Franki Sibberson, Jen Vincent, Alyson Beecher, John, and many more. Fabulous conversation, of course. It was wonderful to put faces (and voices!) to Tweeps after chatting on Twitter for so long. Then, it was time for us all to head to the NerdyBookClub party. Yes, we were some of the only people in Vegas partying it up in a suite where the conversation centered around books. And it was awesome. Donalyn addresses the wild Nerdy crowd. If NCTE is made up of my people, the NerdyBookClub is my tribe. A room full of introverts, noshing on brownies, talking about books. 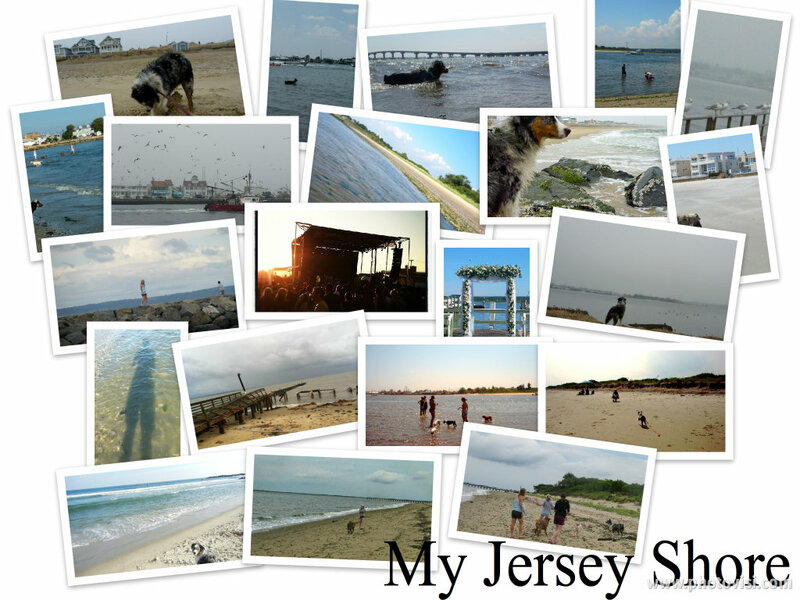 I met so many wonderful folks and got to know many of them better. A huge thank you to Donalyn, Colby, Cindy, and the entire Nerdy-dom for a fabulous, fabulous party. (At this point, I have to admit that I did sneak off a few times to see if the National Board results were posted yet. Once a nerd, always a nerd. At one point, the website went down and I knew the results were being uploaded. I couldn’t handle finding out the results in the middle of the party, so I headed back to my room. Plus, my body thought it was 3am at this point!). Can we have a Nerdy conference? Because the party was seriously awesome. R.J. Palacio (Wonder) was there, Beck McDowell (This Is Not a Drill), and Jonathan Auxier (Peter Nimble and His Fantastic Eyes). Jonathan Auxier treated us to a booktalk about Peter Nimble and he did ridiculously awesome yo-yo tricks while talking. He used to yo-yo professionally! Needless to say, it was pretty much the best party I have ever been to. So many Twitter friends were there, I made new friends, and we shared stories about books and connecting our students with books. I headed back to my room around 3am EST and once I got back, I decided to check my National Board results one more time. As my phone was loading the web page I was taking out my contacts. I glanced over and freaked out when I saw that the website looked different. I squinted, flailed around for my glasses, finally found them, and then read the magic words: “You are a National Board Certified Teacher”! And that’s how I closed out my first night at NCTE. Pretty darn awesome! Saturday was devoted to lots of workshops. I started the morning off bright and early in the sports betting area of the hotel, where Chris placed a bet on the Rutgers game. Then, I headed to my first workshop while he settled in to watch the game in the comfy recliners. My first session was about connecting high school English teachers and first-year compositional teachers. The presenters were an AP English teacher, a first-year comp professor, and a mutual student. It was a great session and made me wish that more students presented at NCTE. It was great hearing from all three stakeholders! I was also happy to hear that college writing teachers do not ban the use of 1st person. Instead, it’s about the students learning to make choices based on audience, tone, and voice. After that session I rushed to the Folger Shakespeare session on assessment while teaching Shakespeare’s plays. I had never made it to a Folger presentation before and I was impressed. However, I did not get much out of the session that I hadn’t already learned from their fabulous professional books. I ended up leaving a few minutes early because my phone was dying and needed a charge. Then I spent some more time in the exhibit hall, where I chatted with lots of publishers and finally met up with Zsofia from Stenhouse. Zsofia and I have been emailing for a few years and it was a pleasure to finally meet in person. She showed me a few upcoming books, which I will be posting about in the next few weeks. Of course, I picked up a bunch of books for my classroom and waited on a few author signing lines. Then I had a fabulous meeting before heading off to the NerdyBookClub session. First of all, The Eagles (yes, those Eagles- the band) were in soundcheck right on the other side of the wall. The NerdyBookClub really is made up of rockstars! The session was awesome and the panelists traveled from table to table, presenting on a variety of topics. Mindi made my day when she told us about Haikudeck, an amazing Ipad app for presentations. But all of the presenters were great and I learned so much. (I was tweeting so much that Chris had to bring my charger downstairs so I could recharge mid-workshop!). Colby Sharp and Tony Keefer presented on their Nerdy Book Club, Jr. and reminded my how much I loved doing the Mock Newbery with my 6th graders. I think it’s time for a mock Printz with my high schoolers. I have ideas…. 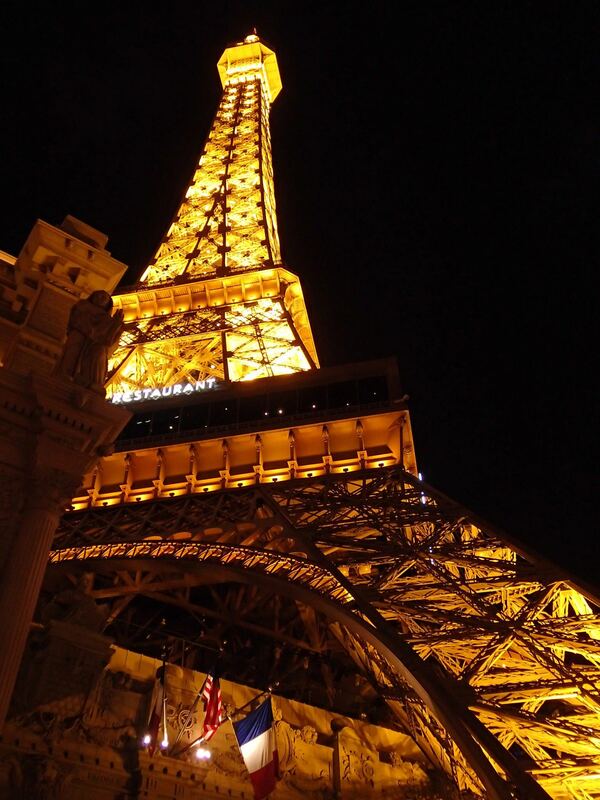 That night, Chris and I decided to see a little bit of Vegas. 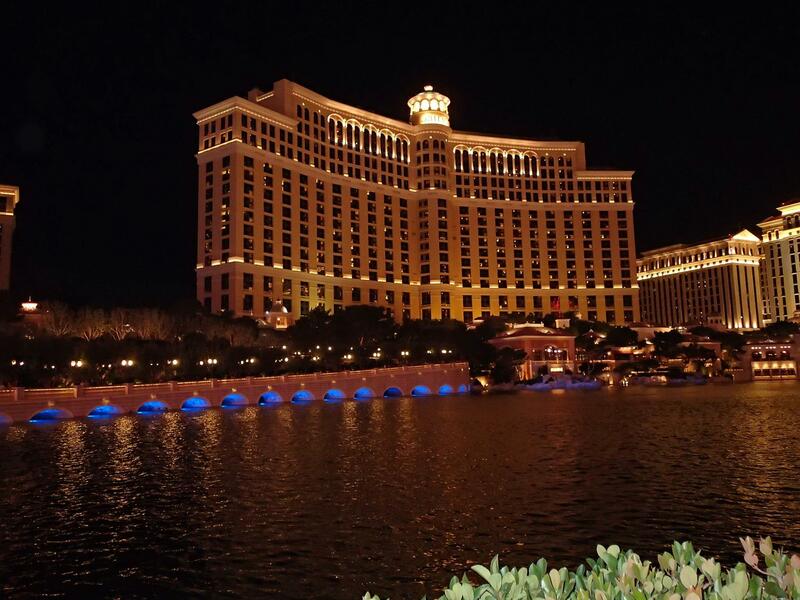 We walked to the Bellagio and watched the fountain show, which was pretty cool. You know what is not a good idea? Walking to the Hard Rock Hotel from the Strip. Everything in Vegas is much farther away than it appears. Almost two miles later, through some very shady areas, we made it to the Hard Rock. 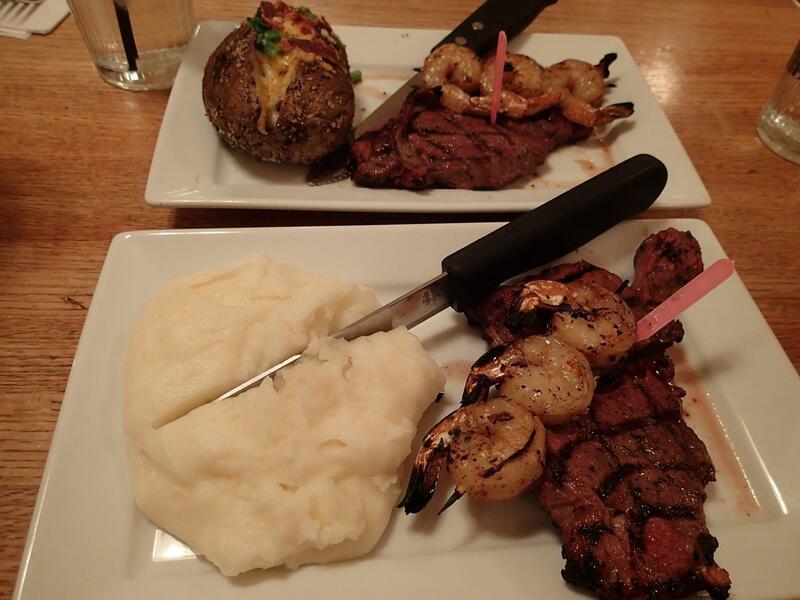 But we got our meal from the secret menu, so it was awesome. Sunday morning started out bright and early with some Starbucks before Chris Lehman and Kate Roberts’ fabulous session on research and note-taking. What a breath of fresh air! I did my student teaching at a TCRWP school and have used lots of their strategies in middle school and high school. However, it’s been a long time since I was in a room of TCRWP folks and this reminded me how much I love them. Chris and Kate were amazing and I am still thinking about what they said. Below are some of my tweets from the session. I had to leave the session early because I needed to get to the exhibit hall to see Eliot Schrefer and Matthew Quick. I felt so bad leaving the session, but I had promised signed copies to some students (and I needed some for me!). Thankfully, the session was tweeted all over so I was able to continue following the last few minutes. And on my way to te exhibit hall I ran into Donalyn Miller and the Paul Hankins, two English idols of mine! Donalyn is a friend, but I had never had the pleasure of meeting Paul in person until that moment. Of course, I was also impatient to get to the signings, but luckily no one understands that more than Paul and Donalyn. So we hugged and chatted before I ran off and made it just in time for my signings! I spent the rest of Sunday networking in the exhibit hall before spending a fabulous lunch with lots of my tweeps. I also made sure I was out of the exhibit hall before the publishers started giving away books they didn’t want to pack up and bring home. My suitcase was already full! Later that afternoon I spent a wonderful time with Kellie, of Walden Pond Press. We talked about upcoming books, books in the classroom, and lots more. Kellie is absolutely fabulous and I am looking forward to chatting with her more at the next conference. Finally, I ended my conference by popping into the ALAN cocktail party. Before entering, a bunch of us Nerdy Book Clubbers met up for a photo. I LOVE this picture and I’m so grateful for this fabulous PLN that has enriched my life. At the party, I chatted with Mike Mullin and probably scared Seth Rudetsky when I practically ran up to him. What can I say? I’m a huge Broadway fan and love all of his work! I also said my goodbyes and made my way back to the room to pack my last few books. Next year I am definitely attending ALAN! Sunday night Chris and I went back out on the Strip and visited the Siren show at Treasure Island, the waterfall at the Wynn, and a few other landmarks. We picked up a few souvenirs, packed our bags, and took a quick nap before checking out at 4am. Our flight left right on time at 6am and made it home at 5pm EST. It was an exhausting weekend but one I would not miss for the world. 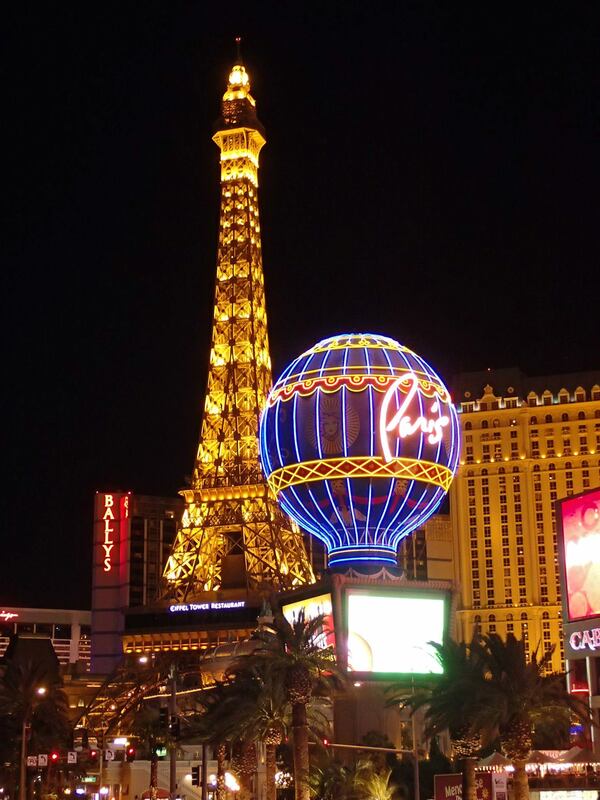 I left Vegas feeling invigorated and brimming with ideas, both personal and professional. I can’t wait to put some of them into action and I look forward to connecting with my PLN even more over the next year. I guess it’s time to start working on my NCTE proposal for Boston? 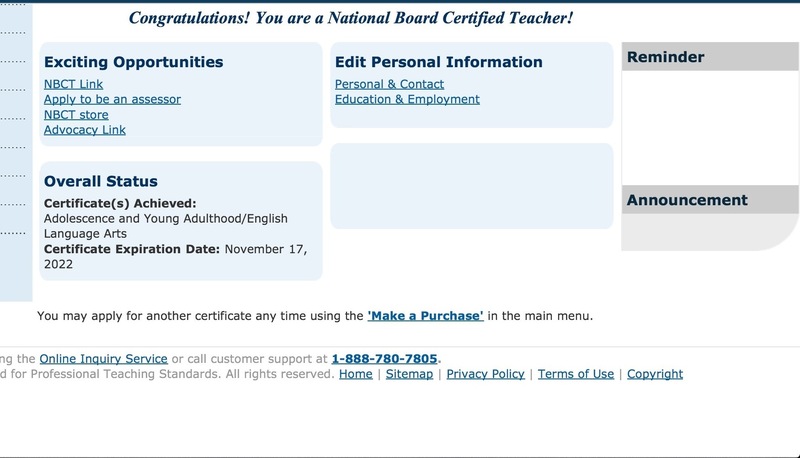 As of 3am on November 17th, 2012, I am officially a National Board certified teacher!!! What’s the difference between a simile, a metaphor, and an analogy?